Jennifer from Ellison Lane Quilting is at it again. 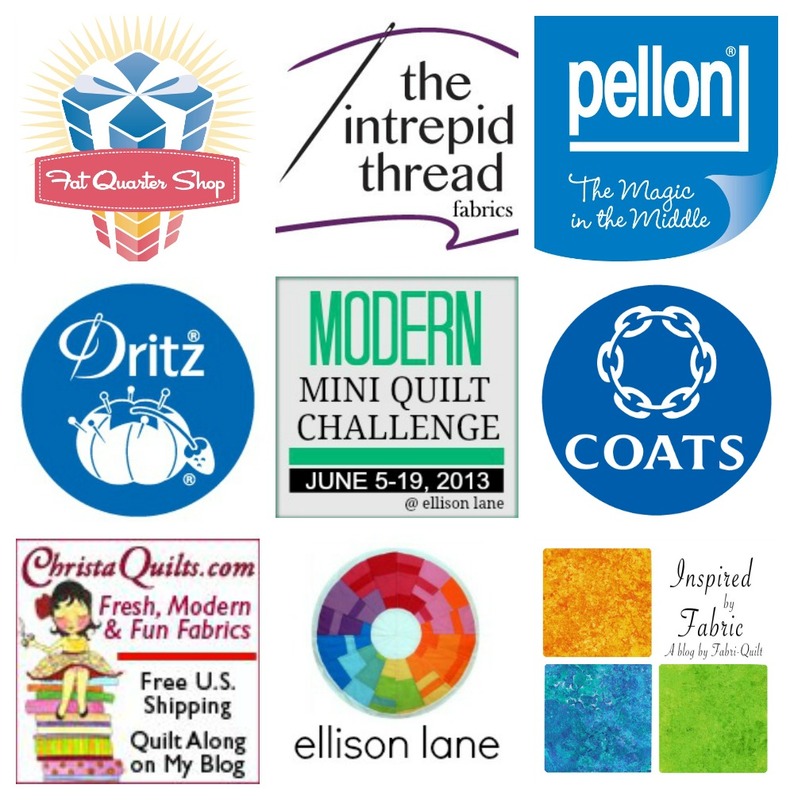 She is hosting another round of the Modern Mini Quilt Challenge and asked me to participate in the blog hop. For my stop I wanted to share a bit more about this pillow I put together a few months ago. I used to think a mini quilt was simply something you might put up on the wall. I've made a few of these, but they really aren't my style. I prefer a "quilt" that's more function. As such, I turn most of my mini quilts into pillows. I love trying new ideas on a small scale before committing to a large quilt. Pillows are perfect for this. For at least a year now, I've wanted to make a quilt using tiny 1" finished squares. I didn't necessarily want to piece the entire quilt with 1" squares, but wanted to incorporate them into the design in some way. I decided to start with a pillow just to get a taste of just how hard it might be to piece all these tiny squares together. I admit all that piecing isn't fast, but it's not horrible either. I've also been itching to try out matchstick quilting. 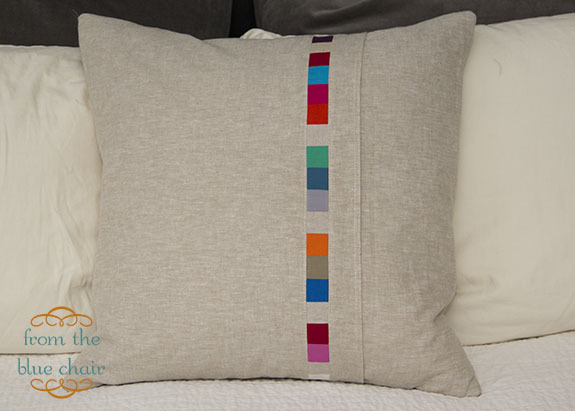 I thought this style of quilting was perfect for this pillow. I quilted approximately 8 lines per inch. I love it on the pillow, but I'm not convinced I could ever do this on a quilt. Another great reason to start small. The piecing on this guy isn't perfect, but I'm telling myself that adds to the charm. I gave up on perfection and just went with it. The quilting also skewed things a bit, but I love the impact and texture from a distance. The result of this experimental pillow is that I decided piecing all those tiny squares really isn't that bad and decided to dive in. I've made five blocks so far. I'm not sure how many more I'll make. I'll probably keep sewing until I run out of the squares. Then I'll decide how to sew everything together. Are you ready for the Modern Mini Challenge? Here's the deal. The Modern Mini Challenge is a call to challenge yourself. Try something new: a new technique, a new pattern, a new thread, etc and make a mini quilt. A mini quilt makes it possible and oh-so-doable! What's a mini quilt? It's a mug rug, a pillow, a wall hanging, a table topper... you get the idea! Check out the amazing minis in last year's contest! There were over 200 awesome entries! You don't have to be an experienced sewist to enter! Don't let your lack of experience keep you from joining in! I want this event to be fun, encouraging and inspiring- just go for it! Believe in your ability and go CREATE!! 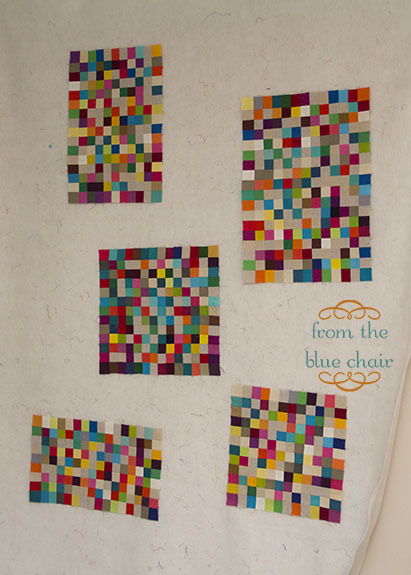 You can enter any mini quilt that you've made within the past 6 months. 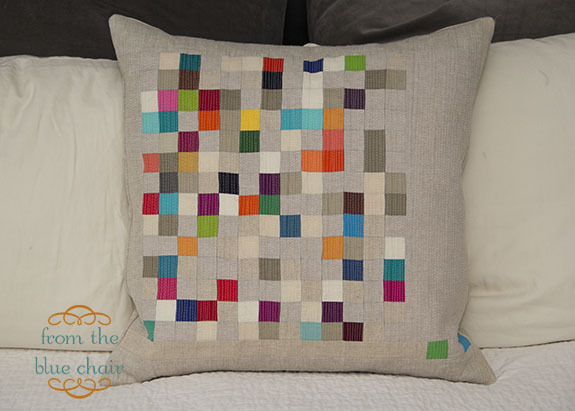 Remember, a mini quilt can be a mug rug, a mini quilt, a pillow, a table topper, etc. Only one entry per person. Size requirements: must be at least 6" x 6" and no bigger than 24" x 24". 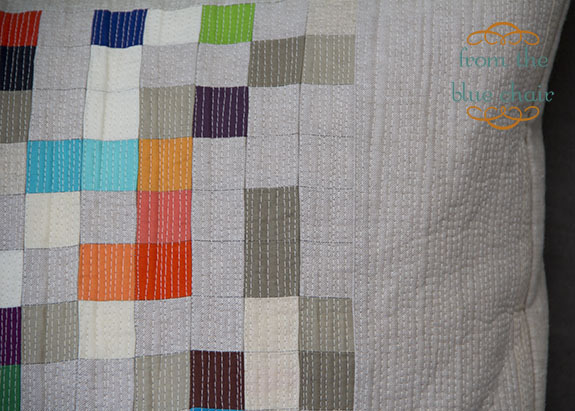 You can enter a mini quilt made from your own design or from a pattern. Please give credit to the pattern designer in your description. Need some inspiration!? Check out all the stops on the blog hop for the challenge. Starting June 12, you'll be able to link up your entry here at Ellison Lane. 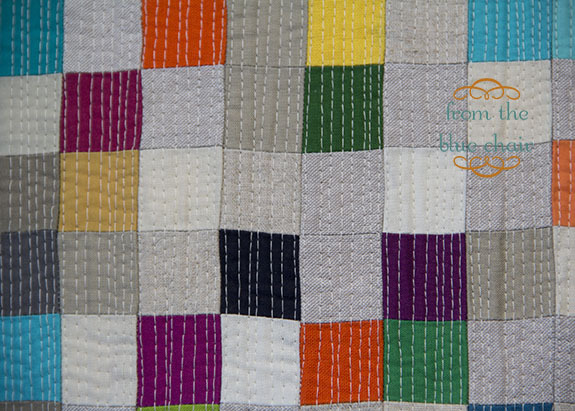 You'll have until 5:00 PM EST on June 16 to add your mini quilt. Link from your blog (a NEW post please), your Flickr account or your Threadbias account. Remember, you don't have to have a blog to enter! Love the pillow, Kati! I can't wait to see where you take the 1" squares with the quilt. As always, you're an inspiration! My grandmother would say, "HANDSOME!" Your pillow is lovely. I can see how easy it would be to adapt to suit anyone by playing with the color palette. Analogous, complimentary, tints and tones of monochrome. I feel inspired just talking about it! Hi Kati! I really really love this pillow! Little patches are wonderful and the play with colours on the natural background looks so beautiful! Thank you for inspiration! The pillow is fabulous! I love the quilting and will have to give it a try. Definitely a good reason to make something small!! For more than a year I've been sewing leaders and enders that are 1-1/2" unfinished squares, making them in to 16-patch blocks. I have more than 80 of them now and don't have any idea how I'll put them together. Right now, I think I can't stop making them! As for your matchstick quilting, do you use a walking foot? Seems like it would make a big difference in how square the quilt ends up. Love those blocks and your matchstick quilting. I always find your projects very motivating! This is the perfect entry & one of my favs! Your pillow is a great testament to starting small. It`s gorgeous. I think your 5 blocks look great as is on your design wall. All that white space around them looks good! You could do the stitching in colour on the white space. . . Thanks for sharing. Ack! I love those mini squares!!!! WOWie! I really like what you've got going on here! And the matchstick quilting is beautiful!